Chinese firms should take full advantage of the upgrading of relations between Harare and Beijing to a Comprehensive Strategic Partnership to invest in Zimbabwe where their investments will be given preferential treatment, President Mnangagwa has said. He said Zimbabwe had opportunities across all sectors of the economy which the Chinese could exploit. 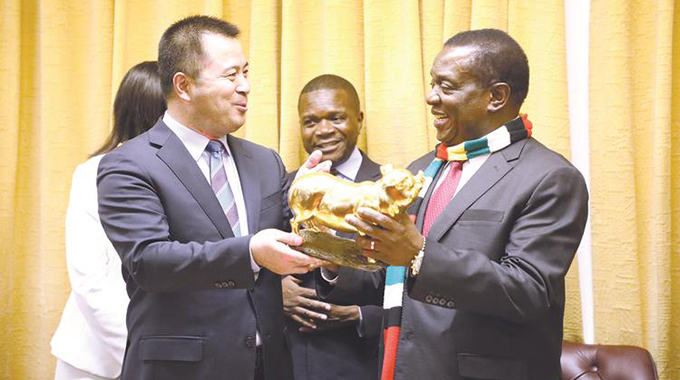 Addressing a high-powered Chinese business delegation — which is in the country to explore investment opportunities at his Munhumutapa Offices in Harare yesterday — the President said from the Zimbabwean side, Government was ready to facilitate the investments. To show the seriousness he attached to the meeting with the Chinese delegation, President Mnangagwa attended the meeting with five Cabinet ministers who included Professor Mthuli Ncube (Finance and Economic Development), Perrance Shiri (Lands, Agriculture, Water, Climate and Rural Resettlement), Winston Chitando (Mines and Mining Development), Mangaliso Ndlovu (Industry and Commerce) and Dr Sibusiso Moyo (Foreign Affairs and International Trade) and Reserve Bank Governor Dr John Mangudya. “Most importantly, during my last visit to the People’s Republic of China, His Excellency the President Xi Jinping upgraded our relations to Strategic Comprehensive Partnership with Zimbabwe which means that we give first preferential treatment to Chinese companies when investing Zimbabwe,” said President Mnangagwa. “I was just telling your head of delegation and chairman (Mr Zhang Huarong) that most Western embassies and countries always say in Zimbabwe there are more investments from China. We don’t want that to be mere talk. It must be material talk backed by evidence of actual investment in this country and you are here — you carry that responsibility. “I and my counterpart President Xi Jinping agreed that we must cooperate but our vision can only actualise if you actually take heed of your President and if my ministers who are on this side also take heed of what I say. I can assure you that on my side I know how to whip. I am happy I can point to some of the projects which have come from China in terms of investment . We have the Kariba South extension which has given us 300 megawatts which is now on the national grid. President Mnangagwa said Government was carrying out both political and economic reforms to facilitate the ease of doing business in the country. Said the President: “Currently, under the new dispensation we are carrying out both political and economic reforms which your country carried 40 years ago. Because we are very close Zimbabwe need not to make mistakes which you made in the process of reforms. We need to get the best out of your reforms – leap frog and develop the rest of the developing countries in our region. “And to achieve this goal of developing our country we are committed to our programme. Economically we have been carrying reforms and also have a stable country, we are a united State. There are so many projects across the board, we still need energy, it could be solar, it thermal, hydro – we need energy in this country the projection that we have is that in another six years from now we need up to 4 000 megawatts because we believe that our economy is going to grow. There are also easy and low hanging fruits like beef, you can begin a beef project into your market . We can also immediately deal with the question of the manufacturing of cigarettes. President Mnangagwa said Zimbabwe was the gateway to the entire African market and the Chinese should take full advantage of that. He said Zimbabwe also boasts of a highest literacy rate in Africa which makes a good market with literate labour force.